Has your roof sustained damage due to a storm? Strong storm wind gusts can cause devastating damage to area roofs. Wind speeds during storms can exceed 50-80 mph. 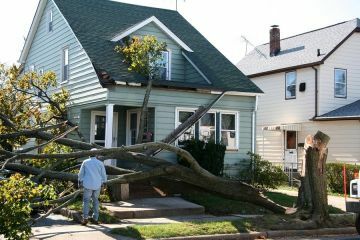 High speed windows can uproot trees and send branches flying, often impacting the integrity of your roofing. Aside from winds, storms often also produce damaging hail. The roof and siding on your home can take quite a beating from the tiny ice balls pelting your home. If your home has been affected by storm damage, you need a contractor ASAP who is skilled in protecting your biggest investment from further damage and repair your home's exterior. Weather is unpredictable; contractors should not be! If you've suffered storm damage, you deserve to find a trusted roofing contractor who can be trusted to get the job done the first time, and at a fair price.. Bolechowski Construction LLC has been a leading provider in reliable roofing services since 2008, and we are here to be your calm after the storm. Our prompt response time to storm disasters will help minimize damage to your property or belongings. The trusted roof repair team at Bolechowski Construction LLC will assess the storm damage and devise an effective solution for restoring your property back to its pre-damaged condition. We will properly secure your property in a timely manner and ensure any insurance claims are processed smoothly. As your roofing experts since 2008, Bolechowski Construction LLC is here for you when storm damage strikes. Call (651) 237-3491 for speedy professional service.